When her best friend is abducted by aliens, Zita leaps to the rescue and finds herself a stranger on a strange planet. Humanoid chickens and neurotic robots are shocking enough as new experiences go, but Zita is even more surprised to find herself taking on the role of intergalactic hero. 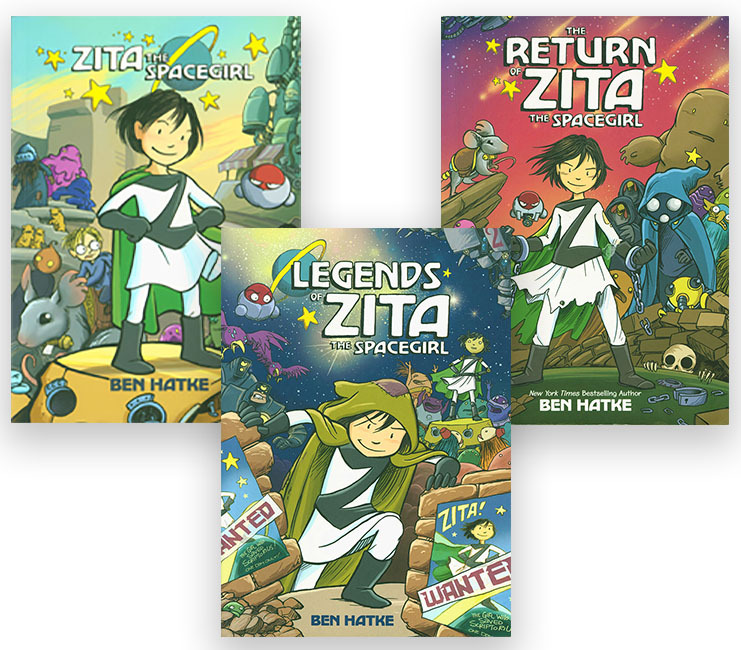 The Zita the Spacegirl Three Book Set contains fun, captivating tales of friendship and redemption by Ben Hatke. A New York Times Bestseller! Softcover. Recommended for Grades 3-6. Ben Hatke is an artist, author and illustrator, and a longtime friend of Seton Home Study School. Since first helping with the graphics for our Elementary Phonics books he has helped us with many projects over the years. He also illustrated several supplemental books that we carry, including Angel in the Waters and Once Upon a Time Saints. He has now gone on to be a New York Times Bestselling Author and Eisner Award winner with his Zita the Spacegirl Trilogy and Little Robot. In addition to writing and drawing comics, he also paints in the naturalist tradition, andloves swords, whistles, juggling, and adventures. He lives and works in the Shenandoah Valley with his wife and their boisterous pack of daughters.